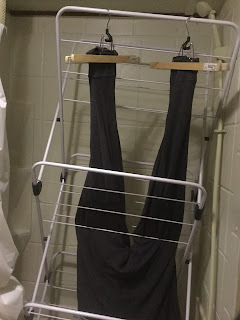 So, the inevitable happened last night, clumsy me spilled something on the pants portion of the stylishly fashionable Quad-Thermal Underwear contraption that has been a stable of my wardrobe for the last month (or two). This means I have to wash them, but since I have sewn the cuffs together that means washing the whole thing, rather than just the affected layer. Cheap me, decided not to do a special laundry run just for this (since I just did laundry on Friday). So this means scrubbing with a brush, some soap in a bucket before leaving it to soak overnight. Funny thing about thermal undies, particularly when they are in grouped together is that they are an effective sponge. Sooo I have a very heavy, damp pair of thermal underwear pants. In order to dry them, these will take a few days in this weather or a nice hot summer day in the sun. The trick is that they are too heavy to just hang over a wire rack, as they will flop down. So the compromise that I came up with was this . . . The wire thing is the wire rack laundry rack that I bought from a large discount retailer. It is built just like a scissor-lift and takes a bit of doing to get into my small bathtub in my micro-bathroom. Up top I have two “pants hangers” or “skirt hangers.” I find them handy in such cases to use as large clothes pegs. This way there is a bit of air getting the inside and the whole thing can drip-dry over the next few days. Thankfully the weather is not too bad these days, so I can just go back to wearing a couple pairs of sweat pants and sweat shirts. Once again function over fashion.